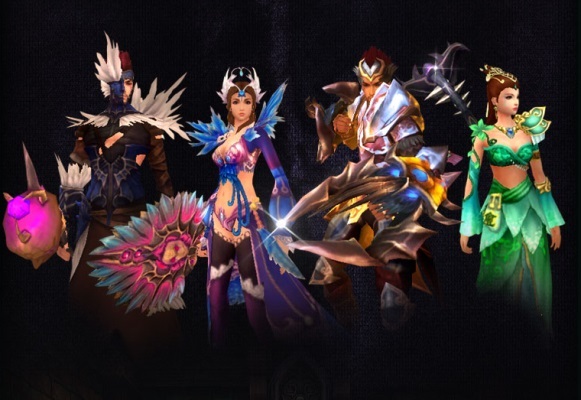 GBE Games, a global publisher and distributor of interactive online entertainment media today revealed its all-new dungeon for its popular fantasy MMORPG, The Aurora World. Starting today, players will face a new challenge to conquer the dangerously difficult new Invisible Dungeon. Players will discover the Invisible Dungeon rich with mystery and intrigue at every turn. Legend speaks of a once beautiful woman whose arrogance and jealousy lead her onto the path of evil. The Gods punished her by transforming into a hideous creature which only angered her, and alas she went dormant contemplating her revenge. Now she has awakened, and players must prepare themselves for the ultimate dungeon challenge! The Aurora World’s story takes place after a cataclysmic war between the Gods in Heaven, leaving the world in chaos. Players will venture across the land to unite powers of good and vanquish evil, taking one eight different professions with their own unique specializations and mastery system, comprising an extensive PvE experience with entertaining daily quests, events and crafting, alongside a robust PvP system that includes large scale Nation Wars, clan wars, a PK system and coliseum mode. The Aurora World also offers the unique hybrid pet/mount system known as Majinns that will aid players in their journey while being immersed into a world of lush environments and detailed character models, powered by Aurora Interactive’s self-developed graphics engine. Card Monsters, a card game (TCG) from Hong Kong developer Mu77, has opened beta testing for Android and iOS players. When I originally looked at the game, it kind of reminded me of a more themepark Age of Wushu.